Unpaid trials in hospitality are often a way to get free labour in busy periods like weekends. It is too common to find restaurants offering unpaid trials every week or so. Mooboo, a company specialising in “bubble tea” with 12 stores around UK, went a step further and started forcing their applicants to do a 40-hour unpaid trial. Mooboo is a company specialising in “bubble tea”, a traditional Taiwanese tea-based drink. The company has 12 stores around the UK, and workers have reported 40-hour unpaid trials in two stores – Glasgow and Liverpool. Better than Zero, a Scottish movement against precarious work, started a campaign a few months ago against these practices. 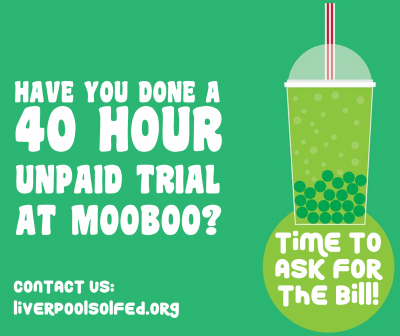 The campaign was really successful and the company recently withdrew their “training process” – so it looks as if Mooboo aren’t doing unpaid trials anymore. However, the campaign has not stopped. Better than Zero is now trying to encourage workers who suffered those unpaid trials to ask the company for the wages they should have been paid. Liverpool Solidarity Federation has agreed to join the campaign and we are encouraging workers to fight back. Unpaid trials are very common, even when this practice is not legal. There is a myth that a company can make you work for free just to check if they like you. This myth will continue until workers change the mentality of being grateful to our bosses for offering us the chance to be exploited. Our time has a value, and if a company wants our time they have to pay for it. Labour relations are not based on equal relationships. A person who lives in a bubble and owns twelve stores around the UK is not in the same position as a desperate person looking for a job to pay their rent and bills. We can begin to equalise the relationship when we organise and fight back. HAVE YOU WORKED FOR FREE? TIME TO ASK FOR THE BILL!